The Fame Wig by Ellen Wille is a beautifully cut short style with long layers. Suitable for any occasion, this short style can be transformed easily from classic to modern and edgy. 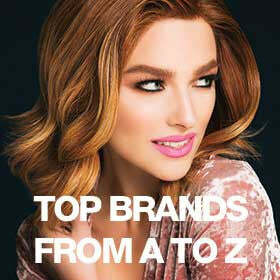 The impeccable ear to ear extended lace front offers you confidence in a seamless, natural hairline.. The premium synthetic fiber used to create the Fame mimics the appearance, feel and movement of biological hair. Front: 4" | Crown: 6" | Sides: 4" | Nape: 3.5"